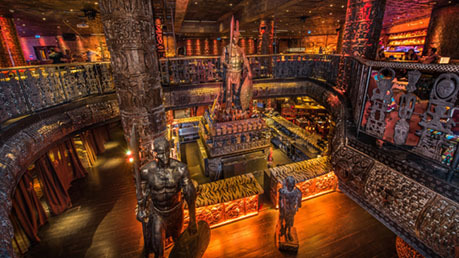 Shaka Zulu is an opulent South African restaurant, bar and club located in Camden, Stables Market. Based over two floors, Shaka Zulu combines some of the culinary specialities of South Africa within its magnificent Braai restaurant. Specialising in delicious home made biltong, pickled fish as well as some authentic dishes like bobotie, sosaties and of course the famous boerewors sausage but to name a few, we also serve the finest steaks and seafood in London. For more adventurous diners and ex-pats wanting a little piece of home, we serve all types of game meat from zebra, springbok and crococile straight from the spit or 'braai'. *T&C's: Not valid in conjunction with any other offer, voucher or discount. Max party size of 6. Offer not valid 31 December.